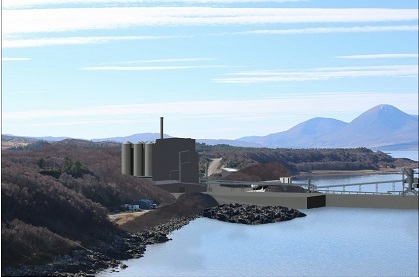 Highland Councillors have today given the go-ahead for a major fish-feed development at Kyleakin on Skye. Developers Marine Harvest say construction at the Altanavaig quarry site will start by the end of March and the £93 million plant will be completed during 2018. They say the state of the art feed plant will employ 55 people in a diverse range of permanent jobs. At a meeting of the North planning committee in Inverness councillors said that the prospect of jobs, and a boost to the area’s economy had to take precedence over concerns over the visual impact of a plant that will include 40-metre high buildings and a 60-metre chimney stack. Isobel McCallum, who chairs the committee, had submitted a motion to refuse the planning application, arguing that the developers had not done enough to meet existing policies on design. Her view that the development needed a more sympathetic design, was backed by Lochalsh councillor Audrey Sinclair. However, Skye councillor Drew Millar moved an amendment to grant planning permission, which was backed by 10 votes to 3. Ben Hadfield Chief Operating Officer Feed and Managing Director of Marine Harvest Scotland said: “I’m delighted with the positive decision from the local authority and even more heartened by the overwhelming support we have had from the local community. We will do our utmost now to ensure that this large construction project is managed in a sensitive way.